Didn't it ever happen to you that you have forgotten an important document in your PC and don't have it stored online anywhere, though you have an access to another computer right now, you wished you could log in to your own system and get it right now? Or, it must have happened a lot of times, that we were asked to help our near and dear ones to guide them through a computer application, when we are not physically present there. In recent days, sometimes service providers also need to be in touch with their clients when a physical meeting isn't possible, and the work is really urgent. Today such issues are been solved through a simple software solution where two remote computers can collaborate and get access to the entire system through remote control. With the latest version of Teamviewer 10 Beta, you can download it FREE and experience the magic of remote sharing. In a nutshell, TeamViewer is a remote control solution for desktop sharing, where actions like file transfer work behind all firewalls and NAT proxies. You do not need any installation procedure to connect to another computer through TeamViewer. Once you run the TeamViewer on both machines the first start is by generation of an automatic partner IDs on both computers in which you have to enter the partner's ID and let the connection get established instantly. Simply download TeamViewer and use it on your Windows, Mac, Linux, or mobile device. Through TeamViewer you can share any single application window or your entire desktop with another user. It works wonderfully while transferring Files, folders, photos, text, folders, and screenshots to and from two computers by using either the regular clipboard function provided in it, or using the file transfer tool in TeamViewer . TeamViewer can be best used as a portable program to enable instant access or to always accept remote connections. TeamViewer 10 brings about significant performance optimizations in which you get CPU usage optimizations for the multi-core processors, faster login and load times for the Management Console, and HD voice transmission quality. With the recent setting policies, you can choose to distribute, or enforce them if you need to do so, and all these will take place through the Management Console. Whatever changes you need to make in the setting of the policies would get automatically applied and effective to all the installations that has taken place. The IT Admins can enjoy with the news that the importing .reg files is no more in the list. The Master Whitelist allows access to every device that you want to connect to by using only one whitelist. You won't have to worry regarding the grant that the users can access through the whitelist to each device it has been attached to. It also reduces the administrative work load by simply adding the names of the companies to the whitelist and you won't have to manage the access rights for each individual user. Now you can maintain a protocol while you are conducting a remote control session, and note down whatever you feel it is important. You need not wait till the end of any session to jot down the comments. TeamViewer 10 proudly announces a state-of-the-art design that has brought new shortcuts which are more convenient for using the common features and options. TeamViewer has been always an intuitive interface which has become easier than before. Now Sharing files during meetings or in remote control sessions have become even more easy as you can start using Google Drive, OneDrive, Dropbox, or Box. Keep your files ready to share. As your data is already stored in the cloud, you save on both the bandwidth and time. Now you have to finish those final preparation work before you go unlocking the door, and start inviting participants as you would always be able to see those who are waiting outside and ask them to join you. Teamviewer 10 has made the whiteboard available while running a remote control session. Both the users would have access to the whiteboard at the same time now. 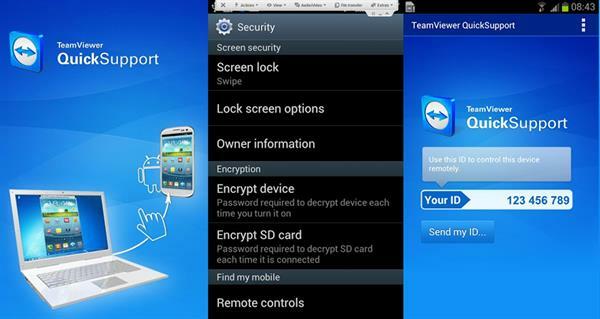 Now The TeamViewer app for Remote Control is also available for your BlackBerry. You can Control remote computers as well as Transfer files from both directions. For better security measures, it has installed the 256 Bit AES Session Encoding, and a 2048 Bit RSA Key Exchange. A free to use software, within which you can chat using text, video, and voice over. It has Remote printing enabled. Supports Wake-on-LAN (WOL). You don't need any port forwarding configurations. The Portable version is also available which doesn't require any installation process. You can control through the desktop program, a remote computer, a mobile device, or an Internet browser. There are plenty of added advantages among which One-click video calls, Adding profile picture, Automatically finding out nearby contacts, an Ultra High Definition support with Greater emphasis on your corporate identity are few. Doesn't allow free usage in commercial settings.